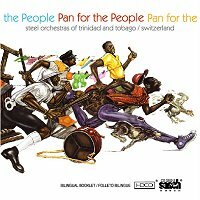 I have been asked time and again "What is your favourite steelband recording?" After fifteen years and a repertoire of over one thousand tracks, the answer is still My Band, Ray Holman's effervescent composition and arrangement as performed by Carib Tokyo Steel Orchestra and recorded at Tokyo's Panyard on February 10th 1988. Each time I listen to this piece, I discover subtle nuances and inner detail in its balanced, cohesive and transparent soundstage. Ray's immaculate phrasing, musicality, metronomic rhythm, seductive introduction, innovative Tassa on Pan ( 4.17 - 4.35), and exquisite bass solo ( 8.06 - 8.48) all contribute heavily towards my sustained bias for this timeless masterpiece. © 2002 Simeon L. Sandiford. Peter Beckles, Jack Renner and I ushered in the era of Digital Panyard Recordings during the 1984 Carnival season with Exodus’s rendition of Lucy In The Savannah performed in the courtyard of the Scarlet Ibis Hotel. The recording was unlike any produced previously and in 1987 Sanch’s work attracted the attention of Amelia Haygood of Delos International, which produced our first CD, Steelbands of Trinidad and Tobago. In that year, I also began my association with artist, Kenneth Scott. His initial design, Pan Jazz Conversations, demonstrated that he was in sync with Sanch’s ideas and our relationship has continued to develop over the years. 1995 marked the launch of the Sanch label with Voices `n Steel, a concert featuring The Marionettes Chorale and The Neal and Massy Trinidad All Stars Steel Orchestra. The year 1997 was highlighted by the formation of two strategic alliances. The first was with Francesca Campi of Italy, and the production of CAM’s Movie Soundtracks Caribbean Style, a CD featuring The Samaroo Jets. The second was Sanch’s first overseas project done for The Rising Stars Steel Orchestra of St. Thomas. John Hodge, that band’s Musical Director had witnessed a recording session during the Carnival season and invited me to produce their CD, A Taste of Carnival. The year was also significant since Sanch became one of only seventy-odd international labels and mastering facilities to utilize Microsoft’s proprietary HDCD® technology invented by Professor Keith Johnson. 2000 was another landmark year; a meeting with Martin Grah and his band, Panch from Switzerland, has resulted in their work being included on two of our 15th anniversary commemorative CDs. I also spent one week in California at Meyer Sound Laboratories. This company’s equipment will be used to amplify live and recorded steelpan music at fetes and on the road for future Carnivals. 2001 realized the production of our Pan In Art 2002 Calendar with Scotiabank being a major investor in this project. Because of the significance of the Meyer Sound System to the future of Pan, and the importance of the calendar to Sanch’s international marketing efforts, I have sought the permission of Ingrid Lashley of the bank and Vaneisa Baksh, a freelance journalist to include their presentations as part of the liner notes of this booklet. Finally, I have been asked time and again " What is your favourite steelband recording?" After fifteen years and a repertoire of over one thousand tracks, the answer is still My Band, Ray Holman’s effervescent composition and arrangement as performed by Carib Tokyo Steel Orchestra and recorded at Tokyo’s Panyard on February 10th 1988. Each time I listen to this piece, I discover subtle nuances and inner detail in its balanced, cohesive and transparent soundstage. Ray’s immaculate phrasing, musicality, metronomic rhythm, seductive introduction, innovative Tassa on Pan (4.17 – 4.35), and exquisite bass solo (8.06 – 8.48) all contribute heavily towards my sustained bias for this timeless masterpiece. It is with personal pleasure and pride in the Bank that I represent, that I endorse this project. This initiative brings Pan to our people in a simple yet sophisticated, educational yet artistic form. Ladies and Gentlemen, I present OUR Pan in Art Calendar 2002. How do you put into words our passion for Pan? I know I speak to the converted … that’s why you’re all here! The life of the Pan is much more than the instrument. It is uniquely national. It is OUR National Musical Instrument. It transcends ethnic, cultural, racial, political, economic and social background. It has supported the evolution of communities, members’ and sports clubs, business ventures and charitable undertakings. It has crossed countries and regions to emerge as an international phenomenon much like Scotiabank has done. Locally, Scotiabank operates in twenty-three communities across Trinidad and Tobago offering products and services that meet the needs of all sectors of our society. Through our involvement and support of charities, NGOs and other worthy causes, we have worked to support social cohesion and the development of our people – in education, in health, in sport and of course, in culture. This is yet another aspect of how Scotiabank pervades the national lifestyle. We are proud to be an engine of promotion for the use of our national instrument as a medium to foster not only local, but also regional and international integration of people, of culture and of Scotiabankers. The success of this will be benchmarked against the success we have had in Sport. We already see the rewards of our investment in Cricket, especially through our Kiddy Cricket Programme, a Scotiabank Caribbean project. It should be no surprise therefore that we would grab the opportunity to participate in this initiative. The idea for this endeavour was born out of discussions with Simeon Sandiford of Sanch Electronix who was, at the time, an active participant in our Trade Mission to the Dominican Republic. Since that early courting, the engagement was speedy and the consummation will come with the unveiling that you will witness today. We commend the vision and foresight of Sanch Electronix and in particular, that of Simeon Sandiford. Sanch has brought professionalism and entrepreneurship to an instrument that has previously been steeped in the misguided notion that Pan is not a business. In adding to the availability and outreach of the project, the Company has added a commercial version of the Calendar which is obtainable for purchase through Sanch Electronix, the Express Newspapers website and bookstores, gift shops and record stores throughout Trinidad and Tobago. In effect, a group of pan enthusiasts have turned a hobby into a business. Going to work must be a real pleasure! Tribute must also be paid to artist, Kenneth Scott. The concept of the Calendar was born out of the nucleus of Kenneth’s drawings for the design of various CD covers, CDs that have been produced since 1987. The synergistic relationship between Kenneth and Simeon has led to a unique collection of Art, of which eight pieces were specially selected for this Calendar. Legends speak of steelband rivalry and open animosity between their membership. There was a time, and it wasn’t too long ago, that for my steelband affiliations born and nurtured in the West, I would visit Hell Yard on the sly. The competitive spirit of the steelband movement would have me park on the greens and stand across the street by Don Carlos to sneak a peek into the Hell Yard and the sweet strains that rise from their music. Today, we seek the comfort of Hell Yard, the place where it began, behind the bridge, among the people. And some may argue the home of the best bands in the land. For the steelband as an instrument and the steelband movement as a body to become more than a quaint local pastime, we must set aside our differences, our trivial uniqueness. We must go beyond our insular competitive spirit if we are to retain our position as creator while adding to the international value of our contribution to the cultural world. Scotiabank recognizes this passion of our people and their passion for the Pan. Scotiabank endorses the Steelpan, a versatile vehicle of musical expression, quickly becoming one of the preferred international music media for relaxation, rehabilitation therapy and spiritual well being. Let this be the beginning of our union – when you think about Scotiabank in culture, think Pan. Ladies and Gentlemen, I invite Mr. Richard Young, our Managing Director, and Mr. Patrick Arnold, President of Pan Trinbago, to join me in presenting to you Scotiabank’s Pan In Art Calendar 2002. Thank you." I always remember the first time I ever heard a steelband play and how it blew my mind. It was in the Croisee, and I was somewhere in my early teens. I remember walking alongside the pan racks while the band inched slowly down the street when the music suddenly rang out. The sound, coming at me out of the darkness on this cold morning, startled and warmed me with its rich, sweet clarity. There really is nothing quite as sweet as the sound of a steelband on the street at that time of the morning. It’s the moments just before dawn when the body itself is still a little muted, and the air holds a promise of excitement still to come that somehow amplifies everything. That moment, when the sound dipped into my still slumbering consciousness and tugged me into alert euphoria, was one that changed me. Changed my understanding of music and unlocked the door to an aspect of our culture which had been shut away my by background. So the sound of steel entered my consciousness, wrapped in an impression of bigness and commotion. The steelband racks were enormous and a little intimidating to my young mind, peopled as they were, by all types of boisterous and occasionally menacing characters. The trucks that pulled them were even more threatening, as they inched through crowds that never seemed to part until the giant cab loomed right upon them, and the crush seemed inevitable. How certain death was avoided over and over, and with such nonchalance and alacrity always amazed me. The cumbersome methods of transport ought to have been a transient stage of the development of the steelband. That time should long have been past. The fallout from the logistic difficulty of having live steelbands at entertainment venues has marginalized the music. That has been one aspect; the other has been the difficulty in reproducing the sound of the bands so as to capture the tonal quality of the various instruments. These should have been addressed long ago, as part of the national investment in the development of the steelband. But steelband music has been given short shrift here at home. We embrace it with fervour at Panorama and dismiss the need to invest in research for its development. That is why the work that Simeon Sandiford has been doing over the years has been so valuable to it. Sandiford, blessed with a scientific mind and a musical ear, has been recording pan at Sanch Electronix for years. He has written countless papers on ways to develop the instrument as a viable industry and as an integral part of our cultural heritage. He has got some very feasible ideas about how the instruments can be easily transported, and marketed, and very importantly, because the recording aspect is his business, he has invested a great deal of time and money in studying how best it can be reproduced. He has been very excited at the prospect of demonstrating to pan aficionados and sceptics just how faithfully and completely pan music can be recorded and played given the right kind of equipment. Come Sunday January 13th, he will be putting on an open-air concert called Pan for the People at the Princes’ Building Grounds in Port of Spain. This concert, which has received the blessings of Pan Trinbago to act as the official launch of the Panorama Season for 2002, will be free to the public. Panorama, by the way, will be a race this year, with preliminary judging, which takes place at the panyards, starting as early as two weeks from now, and the entire season being barely six weeks. Who knows, maybe this concert can replace the traditional Panorama preliminary fete that has been wiped away? Sandiford’s plan is to play some Panorama classics, about five hours’ worth, on a self-powered speaker system, running off a 30kW generator, and designed by the world famous Meyer Sound in Berkeley, California. Now, they design all kinds of mega systems for indoor and outdoor use, but this particular one specially crafted for amplifying steelband music, is capable of generating sound pressure levels of 153 decibels, at one metre from source. If you can imagine that inside a full steelband you reach about 110 decibels (at crescendo level), you might get an idea of its capacity. Sandiford recommends a distance of 150 metres for best listening, though we know some people will still end up leaning on the speakers. But, the idea is not to emphasize loudness; it is to demonstrate the quality of reproduction. Sandiford says the system is touted to be the most ideal for the reproduction of pan music, and his hope is that hearing it will influence decision makers to invest in it to help reintegrate steelband into society. I am so excited to hear it that I plan to be there next Sunday from the time it starts at 1pm to the last note at 6pm. It’s the kind of lime that is child-friendly too, with bouncy castles and face painting, apart from numerous food stalls with Richard’s bake and shark and corn soup, doubles, and the like. Angostura is setting up a bar. CDs, t-shirts and other memorabilia will also be on sale. Pan In ‘A’ Minor, Curry Tabanca, Pan Woman, Birthday Party… the play list is enticing. Hearing steelband music on this system, says Sandiford, will change the way we listen to pan forever. I remember the first time I heard a live band and how it changed me forever, I’m ready for another epiphany. Peter Beckles, Jack Renner y yo introdujimos la era de Grabaciones Digitales de Panyard durante la temporada de Carnaval de 1984 con la ejecución de Exodus de Lucy In The Savannah realizada en el patio del Hotel Scarlet Ibis. La grabación era distinta de las previamente producidas y en 1987 el trabajo de Sanch atrajo la atención de Amelia Haygood de Delos Internacional, que produjo nuestro primer disco compacto, Steelbands de Trinidad y Tobago. En ese año, yo comencé también mi asociación con el artista, Kenneth Scott. Su diseño inicial, Pan Jazz Conversations, demostró que él estaba en sincronización con las ideas de Sanch y nuestra relación ha continuado desarrollando durante los años. En 1995 se lanzó la etiqueta de Sanch con Voices In Steel , un concierto presentando El Coral Marionettes y La Orquesta Neal and Massy Trinidad All Stars. En el año 1997 fueron puestos los toques de luz por la formación de dos alianzas estratégicas. El primero fue con Francesca Campi de Italia, y la producción de CAM’s Movie Soundtracks Caribbean Style, un disco compacto presentando a Los Samaroo Jets. El segundo fue la primera grabación ultramarina hecha por la Orquesta The Rising Stars de San Tomás,. John Hodge, Director Musical, había presenciado una sesión de grabación durante la temporada de Carnaval y me invitó a producir su disco compacto, Un Sabor de Carnaval. El año era también significativo desde que Sanch llegó a ser uno de sólo setenta etiquetas y facilidades internacionales impares que utilizan la tecnología HDCD® de Microsoft inventada por Profesor Keith Johnson. 2000 fue otro año de señal; una reunión con Martin Grah y su banda, Panch de Suiza, ha tenido como resultado su inclusión en dos discos compactos conmemorativos de nuestro decimoquinto aniversario. Pasé también una semana en California en los Laboratorios de Sonido de Meyer. El equipo de esta compañía se usará para amplificar la música de steelpan en vivo y grabada en fiestas y en el camino para Carnavales futuros. En 2001 se realizó la producción de nuestro Calendario Pan In Art 2002 con Scotiabank que es un inversionista mayor en este proyecto. A causa del significado del Sistema de Sonido Meyer al futuro del Pan, y de la importancia del calendario a los esfuerzos internacionales de marketing de Sanch, he pedido el permiso de Ingrid Lashley del banco y Vaneisa Baksh, una periodista independiente que incluya sus presentaciones como parte de las notas de este folleto. Finalmente, me han preguntado repetidas veces - ¿ Cuál es su grabación de steelband favorita? Después de quince años y un repertorio de más de mil canales, la respuesta es todavía ‘My Band, la composición y el arreglo efervescentes de Ray Holman realizados por la Orquesta de Steelband Carib Tokyo y grabados en el Panyard de Tokyo el 10 de febrero, 1988. Cada vez que escucho esta pieza, descubro matices sutiles y detalles internos en su escenario equilibrado, cohesivo y transparente. La expresión inmaculada , la musicalidad, el ritmo metronómico, la introducción seductora, Tassa on Pan innovador, y el solo exquisito del bajo todos contribuyen mucho a mi prejuicio sostenido por esta obra maestra eterna. Es con placer y orgullo personales en el Banco que represento, que apruebo este proyecto. Esta iniciativa le trae Pan a nuestra gente en una forma sencilla, pero sofisticada, educativa y artística. Damas y Caballeros, les presento NUESTRO Calendario Pan In Art 2002. ¿Cómo expresa usted nuestra pasión por el pan? ¡Sé que hablo al convertido … eso es por qué ustedes están todos aquí! La vida del Pan es mucho más que el instrumento. Es extraordinariamente nacional. Es NUESTRO Instrumento Musical Nacional. Sobrepasa el fondo étnico, cultural, racial, político, económico y social. Ha sostenido la evolución de comunidades, de clubes deportivos y de miembros, de empresas comerciales y obras caritativas. Ha cruzado los países y regiones para surgir como un fenómeno internacional tal como Scotiabank. Aquí, Scotiabank trabaja en veintitrés comunidades a través de Trinidad y Tobago ofreciendo productos y servicios que satisfacen las necesidades de todos los sectores de nuestra sociedad. Por nuestro compromiso y apoyo de caridades, ONGs y otras causas dignas, nosotros hemos trabajado para sostener la cohesión social y el desarrollo de nuestra gente – en la educación, en la salud, en el deporte y por supuesto, en la cultura. Esto es todavía otro aspecto de cómo Scotiabank se involucra en el estilo de vida nacional. Somos orgullosos de ser un motor de promoción para el uso de nuestro instrumento nacional como un medio de fomentar la integración no sólo local sino también regional e internacional de gente, de la cultura y de Scotiabankers. El éxito de esto se medirá contra el éxito que hemos tenido en el Deporte. Vemos ya las recompensas de nuestra inversión en el Cricket, especialmente a través de nuestro Programa de Cricket para niños, un proyecto de Scotiabank Caribe. No se debe sorprender por lo tanto que aprovecharíamos de la oportunidad para participar en esta iniciativa. La idea para este esfuerzo nació de discusiones con Simeon Sandiford de Sanch Electronix que era, en ese momento, participante activo en nuestra Misión del Comercio a la República Dominicana. Desde ese encuentro temprano, el compromiso era rápido y la consumación vendrá con el destapar que usted presenciará hoy. Encomendams la visión y la previsión de Sanch Electronix y particularmente, las de Simeon Sandiford. Sanch ha traído el profesionalismo y la iniciativa empresarial a un instrumento que ha sido saturado previamente de la noción malconcebida que el Pan no es un negocio. Al añadir a la disponibilidad y al alcance del proyecto, la Compañía ha agregado una versión comercial del Calendario que se puede comprar en Sanch Electronix, el website del Express Newspapers y librerías, las tiendas de regalos y tiendas de discos a través de Trinidad y Tobago. En realidad, un grupo de entusiastas de Pan ha convertido un pasatiempo en un negocio. ¡Ir a trabajar debe ser un placer verdadero! Se debe rendir homenaje también al artista, Kenneth Scott. El concepto del Calendario nació del núcleo de dibujos de Kenneth para el diseño de varias cubiertas de discos compactos que se han producido desde 1987. La relación sinérgica entre Kenneth y Simeon ha producido una colección extraordinaria del Arte, de la cual ocho piezas fueron escogidas especialmente para este Calendario. Las leyendas hablan de la rivalidad de steelbands y la animosidad abierta entre sus miembros. Erase una vez, y no hacía mucho tiempo que a causa de mis afiliaciones de steelband nacidas y nutridas en el Oeste, yo visitaba a hurtadillas Hell Yard. El espíritu competitivo del movimiento de steelband me hacía estacionar on the greens y estar de pie a través de la calle Don Carlos para echar furtivamente una mirada en Hell Yard y los sonidos dulces que surgen de su música. Hoy, buscamos el consuelo de Hell Yard, el lugar donde comenzó,detrás del puente, entre la gente. Y algunos pueden discutir la cuna de las mejores bandas del país. Para que el steelband como un instrumento y el movimiento de steelband como un cuerpo lleguen a ser más que un pasatiempo local anticuado, nosotros debemos apartar nuestras diferencias, nuestra unicidad trivial. Debemos ir más allá de nuestro espíritu competitivo insular si deberemos retener nuestra posición como creador añadiendo al valor internacional de nuestra contribución al mundo cultural. Damas y Caballeros, invito al Sr. Richard Young, nuestro Director Gerente, y al Sr. Patrick Arnold, Presidente de Pan Trinbago , a presentarles juntamente el Calendario del Arte 2002 de Scotiabank. Gracias." Yo siempre recuerdo la primera vez que oí un conjunto de steelband y cómo me impresionó. Fue en el Croisee, y yo era adolescente. Recuerdo caminando al lado de las rejillas de los pans mientras que la banda se adelantaba despacio por la calle cuando la música sonó repentinamente. El sonido,acercándome fuera de la oscuridad en esta mañana fría, me asustó y me entibió con su claridad rica y dulce. Realmente no hay nada tan dulce como el sonido de un steelband en la calle en aquel momento de la mañana. Son los momentos antes del amanecer cuando el cuerpo está todavía un poco lento, y el aire tiene una promesa del entusiasmo tranquilo que amplifica todode algún modo. Ese momento, cuando el sonido mojó en mi conocimiento soñoliento y me conmovió en euforia alerta, fue uno que me cambió. Cambió mi comprensión de música y abrió la puerta a un aspecto de nuestra cultura que se me había cerrado por mis antecedentes. Así el sonido de acero entró mi conocimiento, envuelto en una impresión de grandeza y tumulto. Las rejillas de steelband eran enormes y un poco amedrentadores a mi mente joven, pobladas como eran, por toda clase de tipos bulliciosos y ocasionalmente amenazantes. Los camiones que las tiraban eran aún más amenazantes, cuando avanzaban despacio por la muchedumbre que nunca parecía apartarse hasta que la cabina gigantesca asomaba sobre ellos, y el agolpamiento parecía inevitable. Como la muerte cierta se evitaba repetidamente, y con tal indiferencia y prontitud siempre me asombraba. Los métodos incómodos del transporte deberían haber sido una etapa transiente del desarrollo del steelband. Aquella época debe haber pasado hace mucho tiempo. La dificultad logística de tener en vivo los steelbands en lugares de entretenimiento ha marginalizado la música. Eso ha sido un aspecto; el otro ha sido la dificultad de reproducir el sonido de las bandas para capturar la calidad tonal de los varios instrumentos. Esto debe haberse dirigido hace mucho tiempo, como una parte de la inversión nacional en el desarrollo del steelband. Pero la música de steelband no ha recibido mucha atención aquí en el país. Nosotros lo abrazamos con fervor en Panorama y despedimos la necesidad de invertir en la investigación para su desarrollo. Eso es el por qué el trabajo que Simeon Sandiford ha estado haciendo durante los años ha sido tan valioso. Sandiford, bendecido con una mente científica y una oreja musical, ha estado grabando el Pan durante años en Sanch Electronix. El ha escrito papeles innumerables sobre cómo desarrollar el instrumento como una industria viable y como una parte integrante de nuestra herencia cultural. El ha obtenido algunas ideas muy posibles acerca de cómo los instrumentos se pueden transportar fácilmente, y pueden ser vendidos, y muy importante, porque el aspecto de grabación es su negocio, él ha invertido muchísimo tiempo y dinero para estudiar cómo reproducirlas mejor. El ha estado muy emocionado sobre la posibilidad de demostrar a los aficionados y los escépticos del Pan cuán fielmente y completamente música de Pan se puede grabar y puede ser tocada dada la clase correcta del equipo. El domingo, 13 de enero, él estará presentando un concierto al aire libre llamado Pan for the People en Princes’ Building Grounds en Puerto de España. Este concierto, que ha recibido las bendiciones de PanTrinbago para actuar como la lancha oficial de la Temporada de Panorama para 2002, será gratis al público. El panorama, será una carrera este año, empezando con las preliminares, que tienen lugar en los panyards, dentro de dos semanas , y la temporada entera es apenas seis semanas. ¿Quién sabe, quizá este concierto reemplace la fiesta preliminar y tradicional de Panorama que ha sido quitada? El plan de Sandiford es tocar algunos clásicos de Panorama, acerca de cinco horas, en un sistema auto accionado, corriendo de un generador 30kW, y diseñado por el Sonido famoso de Meyer en Berkeley, California. Ahora, ellos diseñan todas clases de sistema mega para el uso interno y al aire libre, pero este particular especialmente diseñado para amplificar la música de steelband, es capaz de engendrar los niveles de la presión del sonido de 153 decibeles, a un metro de la fuente. Si usted puede imaginarse que dentro de un steelband repleto que se alcanza acerca de 110 decibeles (en el nivel del crescendo), usted quizás obtenga una idea de su capacidad. Sandiford recomienda una distancia de 150 metros para mejor escuchar, aunque sabemos que cualquier persona acabará inclinándose en los parlantes. Pero, la idea no deberá acentuar la fuerza; deberá demostrar la calidad de la reproducción. Sandiford dice que el sistema es alabada ser la mejor para la reproducción de la música de Pan, y su esperanza es que al escucharlo las personas que toman las decisiones inviertan en ella para ayudar al steelband a reintegrarse en la sociedad. Estoy tan emocionada escucharlo que tengo planes de estar allí el próximo domingo del comienzo a la 1pm hasta la última nota a las 6pm. Es la clase de fiesta que es apta para los niños también, con castillos rebotantes y pintura de caras, además de numerosos kioscos de comida con el bake y tiburón y sopa de maíz de Richard, los doubles,etc... Angostura establecerá un bar. Discos compactos, las camisetas y otro memorabilia estarán también de venta. Pan in A Minor, Curry Tabanca, Pan Woman, Birthday Party ...la lista es atractiva. La música de steelband que se oye en este sistema, dice Sandiford, cambiará la manera en que escuchamos el Pan para siempre. Recuerdo la primera vez que oí una banda en vivo y cómo me cambió para siempre, yo me preparo para otra epifanía. All selections administered by COTT.